I thought it would be neat to share the Traditional and Modern ideas for Anniversary gifts. 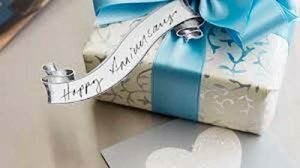 Several years ago, I helped my parents celebrate 50 years of marriage and when I was thinking about what to give them, I looked at this list to help give me some inspiration. Now, I thought it might help give our readers some ideas! While, some of these ideas seem somewhat boring or “un-gift” like, but if you take the item and try to put an interesting spin on it… it can be both meaningful, thoughtful and could possibly even start a new and fun tradition. For example, Paper could be given in the form of a journal (either written in as a summary of your 1st year of marriage) or for your partner to document their own thoughts and ideas. Leather could be in the form of a suitcase or briefcase, cotton could be either clothing, blankets, or a quilt made of something you and your partner picked up somewhere on vacation, etc.. Think outside the box and start a new tradition! By the way, Happy Anniversary!! !